The new bio-degradable Care Bag is a commode potty liner containing a special that absorbs and gels waste. After using, the liner is simply removed, sealed with a draw string and disposed, either by incineration or as the care bag is bio-degradable into normal household rubbish. 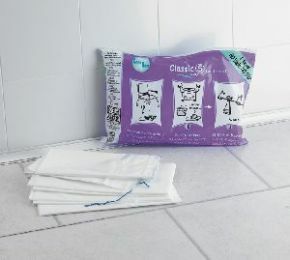 By gelling and containing the waste the Care Bag reduces spills and contamination, eliminating the onerous and time consuming need to wash the commode potty. Ideal for use in homecare, where it provides a hygienic, simple and convenient solution to emptying the used potties. Supplied in a pack of 20. I am forever indetebd to you for this information.